Garden Area, One Year On…Innovation or Playing Catch-up? It has been just over one year now since the “garden area” requirement was introduced through Planning Scheme Amendment VC110. It was introduced as a new mandatory regulation, in which that land zoned within a General Residential Zone or Neighbourhood Residential Zone needed to be set-aside for garden area dependant on land size. After a year of dealing with this regulation, I wonder whether this regulation truly ‘talks the talk.’ I wonder whether this regulation is playing ‘catch-up’ or implementing an innovation? 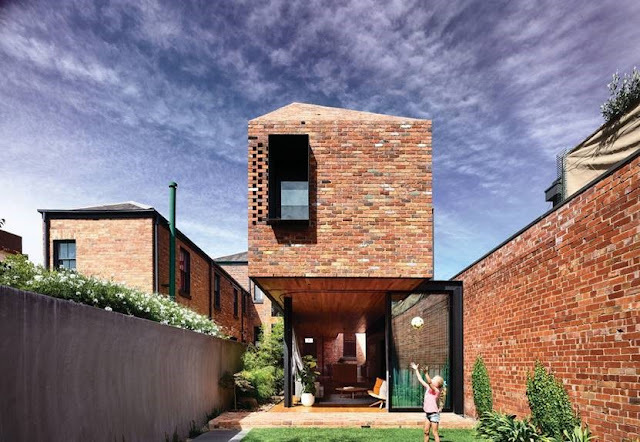 The explanatory report appears to signal that it is attempting to minimise the presence of excessive hard surfaces (hence reducing the excess stormwater runoff), and to minimise the size of buildings itself (in favour of landscaping values and neighbourhood character). At the time of writing this article, no practice note has been released nor further explanatory notes has been released to be discuss how or why ‘garden area’ came to be. It worries me that, based on the words of the explanatory report, its intent to minimise building coverage and maximise permeable surfaces. Doesn’t this sound familiar? Under our current building design regulations (commonly called ‘ResCode’) in Victoria, there are already two established standards for controlling these aspects for building design: Site Coverage (Standard A5 and/or Standard B8) and Permeability (Standard A6 and/or Standard B9). In relation to site coverage, ResCode sets a state-wide ‘standard’ allows development to cover up to a maximum 60% of a land. In relation to permeability, it requires development provide a minimum of 20% permeable surfaces. Additionally, Council’s are allowed to ‘vary’ these two state-wide standards (that is, they have the flexibility to specify a municipal-specific maximum site coverage and minimum permeability). Across Metropolitan Melbourne, there are multiple Councils that have municipal-specific site coverage (generally lower than the state-wide provision), and permeability (generally higher than the state-wide provision). 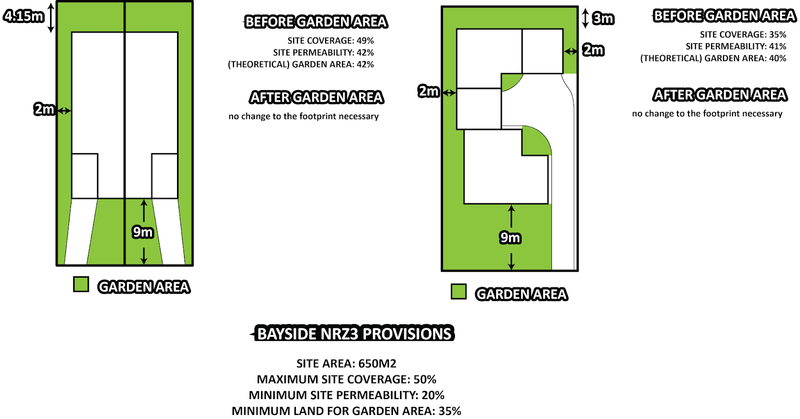 So if it the intent of garden area is to minimise building coverage and maximum permeable surfaces (which is already controlled) – why not simply change just lower the Standard A5/B8 and increase Standard A6/B9? Why add a new layer of complexity into the equation? At least this would have avoided the introduction of a whole new term that has been subject to a diverse interpretation and scrutiny. To better explore this, I decided to do a bit of simple testing (two dwellings only on 650m2 blocks of land with a 18.28m wide frontage using a side-by-side development and tandem style) in terms of whether the garden area requirement really does what its intended to do. Schedule 1 of the Neighbourhood Residential Zone in the Bayside Planning Scheme (in place since 2014 and is the only NRZ schedule). Figure 1. Victorian State Wide Provision Testing. In respect of a side-by-side layout, the test against the State Wide provisions showed that only a marginal decrease to a building footprint permitted was necessary to achieve compliance with the garden area requirements. In respect of a tandem layout, no changes were actually needed to the footprint, between the before and after introduction of garden area. In respect of both types of layouts for these two Council’s no actual changes to the footprint were necessary to achieve compliance with garden area requirements, based on current schedule provisions within each respective Council. Although, this testing does not cater to local planning policy preferences and does not account for other provisions of building design (such as perceived visual bulk, tree overlays, internal layouts and upper level setbacks etc…), it does show a ‘base line’ envelope would have achieved the garden area requirements (whether one was introduced or not). It could even be suggested that these envelopes ‘go too far,’ but even if this were the case, any scaling back to lead to an envelope that is more compliant with garden area. 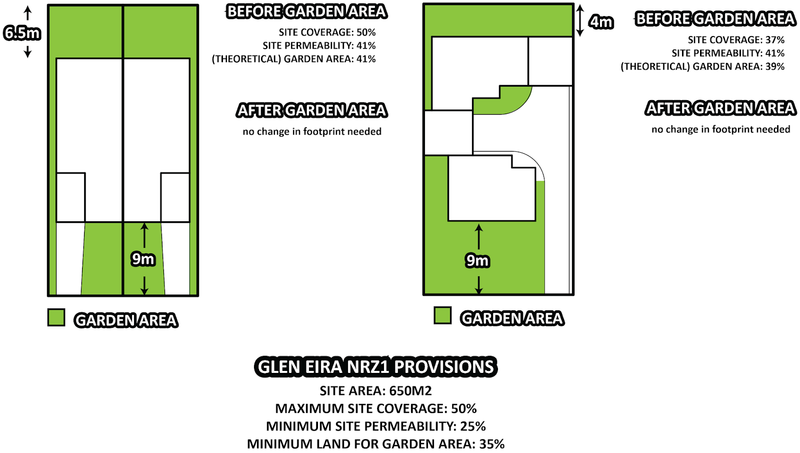 It seems that the introduction of the garden area regulation would have minimal affect for a typical infill style 2 dwelling development, and actually appears to do does very little to maximise permeability especially where municipal-specific schedules already appear to support footprints that support this intent, anyway. 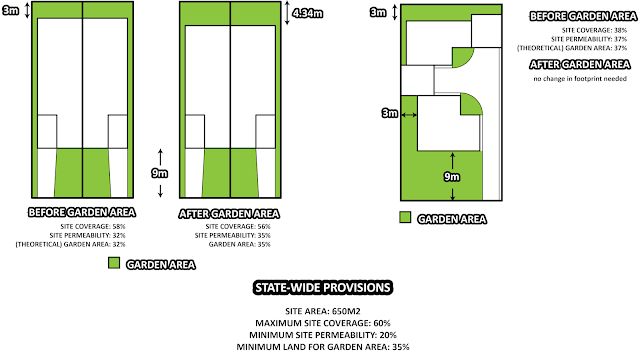 Perhaps, the ramifications of garden area requirements may become much more obvious for developments that exceed more than 2 dwellings, however, that may be a test for another day. But in the mean time, it does appear that an introduction for a ‘garden area’ appears to just be ‘reinventing the wheel’ when its intent (as currently understood through the explanatory report) could be achieved through various other means that are already available. Is the garden area truly providing an innovative means to support more permeable surfaces, or is it simply playing catch up with other municipalities? The explanatory report can be found on the Planning Scheme Amendments Online website under PSA VC110.